Originally published under the title, "U.S. should 'unfriend' Isis." After capturing large stores of American weapons in Mosul last summer, ISIS tweeted this doctored version of Michelle Obama's #bringbackourgirls appeal for the release of 276 Nigerian schoolgirls kidnapped by Boko Haram. The White House was not amused. As absurd as "unfriending" a terrorist organization sounds, the Obama administration's use of social media to counter what it euphemistically calls "violent extremism" has been equally feckless. On Jan. 7, White House Press Secretary Josh Earnest acknowledged "the need to counter some of the extremist ideology that ISIL is propagating, using some pretty sophisticated social media strategy." Five days later ISIS hacked Centcom's social media accounts. Sadly the U.S. has been slow to recognize the strategic importance of the Internet and social media in what has become known as the "theater of terror." Al-Qaeda spent the 1990s growing its capabilities and establishing new ways of communicating. On some of the earliest terrorist websites, Al-Qaeda told its followers "We must make the Internet our tool." By contrast, on 9/11 the inadequacy of the FBI's computer system became apparent. The Obama White House has been conspicuously inept on the cyber battlefield. The Obama White House has been conspicuously inept on the cyber battlefield. In 2009 as Iranian dissidents took to Facebook and Twitter with their Green Revolution, the president squandered opportunities to facilitate them, preferring to negotiate with the very despots who would later publicly mock him, sometimes via Twitter. Then came the State Department's feeble hashtag diplomacy campaign, which began when @StateDeptSpox Jen Psaki responded to Vladimir Putin's invasion of Ukraine by tweeting a selfie, holding a placard bearing the message: #UnitedforUkraine. Armed with the new hashtag #BringBackOurGirls, Michelle Obama became the face of a social media offensive against Boko Haram, a terrorist organization her husband's administration long refused to label as such even as it carried out raids, kidnappings and suicide bombings. 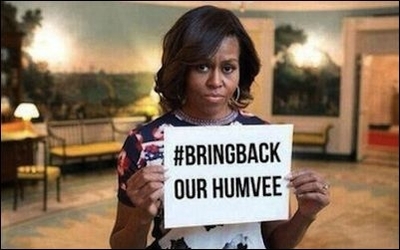 After overrunning Mosul and capturing US military hardware, ISIS parodied the first lady by tweeting a Photo-shopped image of her with the altered hashtag #BringBackOurHumvee. One hopes that efforts are under way to exploit the weaknesses of terrorist organizations and manipulate the estimated 90,000 tweets generated by ISIS every day. But such optimism seems unfounded given the president's reluctance to acknowledge the Islamist ideology that motivates Al-Qaeda and its offspring. Any hope that the recent Summit on Countering Violent Extremism will yield useful results is dashed by scant evidence of the "sophisticated social media strategy" Earnest promised or of the creative approaches to fighting terrorism urged by the 9/11 Commission a decade ago. The NSA and DIA should be hacking terrorists' social media and sowing dissent among their ranks. What would ISIS Caliph Abu Bakr al-Baghdadi's followers do if they thought he was negotiating with Iran? Or sexting? Senator Obama ran for office as the most tech-savvy presidential candidate ever and indeed mobilized an online army of community organizers propelling him to victory. It's becoming increasingly painful to watch him cede the cyberwar advantage to our enemies. Even the "hacktivist" group Anonymous appears to be waging a more effective fight against ISIS. So rather than "unfriending" ISIS, the Obama administration seems more inclined to "Like" ISIS, join its LinkedIn network, or maybe fly James Taylor to Aleppo for a comforting song. A.J. Caschetta is a Senior Lecturer at the Rochester Institute of Technology and a Fellow at the Middle East Forum. He can be reached at ajcgsl@rit.edu.